I needed a new outfit for a little trip I was taking and I needed something that was not covered in playground mulch or macaroni and cheese. So in a rush, I had to take the world’s worst shopper, better known as my Screaming Mimi, to the mall. I strapped Mimi into her stroller and braved the stores. Two gals taking on the mall and the fashion world. What could go wrong? Well let’s just start with Mimi. I dreamed of the days she and I would shop together, have leisurely lunches, and share a laugh or two. Mimi didn’t get her nickname of Screaming Mimi because it was funny. Girlfriend has a set of lungs that even Beyoncé would be jealous of. We weren’t in the mall for more than ten minutes when she started the wailing, and as if by magic, someone turned up the heat. 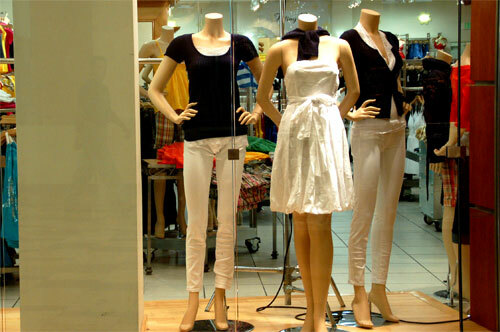 I was sweating, people were staring, Mimi was inconsolable, even mannequins were judging me. I needed to work fast: get in, grab an outfit, and get out. We passed a storefront with some questionable selections, but lo and behold there was one mannequin with a decent outfit that was Mom appropriate. I rushed inside just before looking at the name of the store, “Wet Seal”. What? Ewwwww? Any parent should be a little suspect when letting their daughters shop in a store with a semi dirty name. Oh, you didn’t think it was dirty? Betcha you do now. But I digress, upon entering the store I could clearly see this place was better suited for the styles of young ladies that have not seen the joys of child-bearing; however, I needed an outfit and Mimi needed the hell out of the mall. Among the sequins, day-glow, and bad 80’s reproductions (dang, are those things really in style? ), I saw the Mom approved outfit from the window. I tried to get over to the display but was stopped in my tracks by a huge table covered in glitter tank tops. I moved left and there were more scantily clad mannequins. I moved right and I ran into a furry boot display. No matter how I moved, I couldn’t get Mimi’s stroller over to the one outfit I could actually wear in public without ultimate humiliation. Just then someone turned the heat up again, (why do they do that?) and the sweating and screaming kid became even more unbearable. Fine! I give up!! Clearly this store is anti-stroller (take the hint,lady).I turned and pushed Mimi out of the dirty named store and gave the evil eye to the traitorous mannequin in the window. Mimi is a gal on the move. You can’t tame a wild one with a stroller (even though 75 other kids in the mall were sitting in their strollers calmly). Our time of shopping together will come, just not right now. Gone are the days of shopping with great ease and convenience (well for a little while). Until those days are reclaimed, there is online shopping where you can drink wine while pursuing, slutty mannequins don’t judge you, and inappropriately named stores and obstacle courses can’t hold you down. Take that, Wet Seal!